Back of House with window removed to access candle. Chimney tops removed so that chimneys actually function. 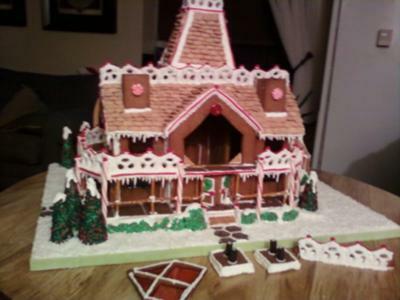 My boyfriend and I made this house while stuck indoors for a week during the East Coast Blizzard this past winter (2010). It was our first attempt at gingerbread house making and we "borrowed" some ideas from many houses we saw online. The floor plan was based off of Disney World's Grand Floridian life-sized gingerbread house. The roof tiles were made out of Cinnamon Toast Crunch cereal and the holly shrubs were made out of shaped rice crispy treats. The snow was coconut and the windows were melted Jolly Ranchers. The large window in the back could be removed so that a candle inside the house could be lit and chimneys really work too! The smell of warm gingerbread filled my apartment every time we lit the candle which flickered through the windows. Overall, we were very pleased with our first house and plan to make another next year.